Our Little Yorkie Bella is so sweet. Bella is 12 weeks old and weighs 2.4 lbs. at 12 weeks of age. Bella has a beautiful Black and Tan double coat. She is also very short legged and a short body. Just as cute as can be. 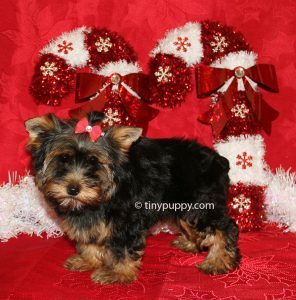 Bella’s Momma is 1/2 parti Yorkie. Her dad is Black and Tan. 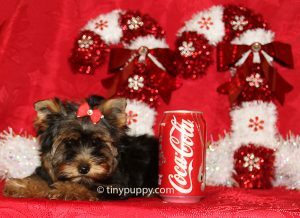 Our Little Yorkie Christmas Bella is ready now to come be your little Christmas Joy. Financing is available.